Floating and invisible. The all-new Coloma Closet & Storage System from Häfele America Co., one of America’s leading suppliers of closet organization and storage components, is an Italian-styled, concealed closet system which makes clothes and casework appear to float―a particularly sought after style in today’s closet market. With a stylish, sleek design, Coloma cleverly hides mounting hardware and brackets either behind shelves and drawers or within very narrow, vertical mounting channels. Featuring three-way adjustability, Coloma hardware can be adjusted up and down, in and out or side-to-side to better suit your needs and design. In keeping with the European styling, Signature closet rods suspend from shelves making your clothes appear to float with other accessories and cabinetry. This system is ideally suited for nearly any configuration—from space constrained applications to those where storage needs and real estate are widely abundant. Coloma hardware is available in four standard depths: 12”, 14”, 18” and 22” and in either Silver or Oil-Rubbed Bronze finishes. Also featured at AWFS 2017 is the ENGAGE Closet & Storage System which features modular, stylish shelves and drawers which fully extend and come standard with soft close action. ENGAGE includes a wide array of hampers, dividers, shoe organizers, folding stations and storage boxes to suit any configuration. ENGAGE hampers even come equipped with scratch-resistant handles which can be grabbed with one hand, emptied and returned to the closet with ease. Most ENGAGE system components come pre-assembled, allowing for easy and efficient installation. Finishes include Matt Nickel frames with Slate fabric or Oil-Rubbed Bronze with Beach fabric in standard 18”, 24”, 30” and 36” depths. Drawers are available in both regular and tall drawer front depth with matching dividers. Even more personality and style can be added with drawer face adapters to conceal frames and dividers. 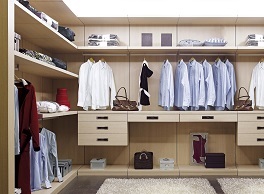 Rounding out Häfele’s offering of closet and organization solutions featured at AWFS 2017 is an array of Synergy and Synergy Elite components including mirrors, tie racks, belt racks, wardrobe tubes, valet pins, storage hooks and more. These handsomely finished pieces are ideal for complimenting previously existing closet configurations or incorporating into future storage projects.